The River Suir from New Bridge to Knockacolla is a broad slow winding river with fast shallow glides, riffles and infrequent pools. It contains good stocks of trout up to 25cm. 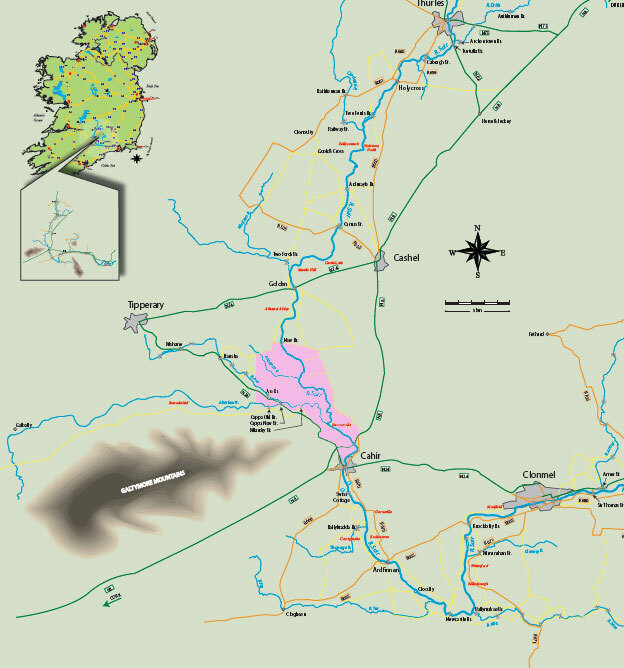 Approximately 6.5 km north of Cahir in the Ballydrehid /Knockacolla areas the combined Rivers Ara and Aherlow form a confluence with the River Suir. The River Ara provides angling from above Killshane downstream to its confluence with the River Aherlow. The waters around the Killshane area and downwards are a series of glides, riffles and pools. From the village of Bansha (N24) downstream is a continuous glide, with some riffle areas and few pools. Overall this is an excellent angling stretch. With trout stretching in length up to 28 cm, one can have a quiet, enjoyable summers evening with a small fly rod, proper presentation and the right fly. The Ara Angling Club controls the waters of the River Ara. The River Aherlow may be described as a spate river, which runs through the scenic Glen of Aherlow. It holds large numbers of trout up to 20 cm. The best angling sections are regarded in the upper stretches around the Galbally area, and the lower reaches downstream of Cappa Old Bridge. The Aherlow Angling Club exists on the section from Rossadrehid to its confluence with the River Suir. The water from Knockacolla to Cahir consists of a deep channel, which contains limited numbers of good adult trout. Cahir and District Angling Club control the fishing on the right or west bank from Suir Castle to the Bakery Weir north of Cahir. Downstream of Cahir town for 200 m the fishing is not available at present. Cahir Angling waters continue from that point downstream.